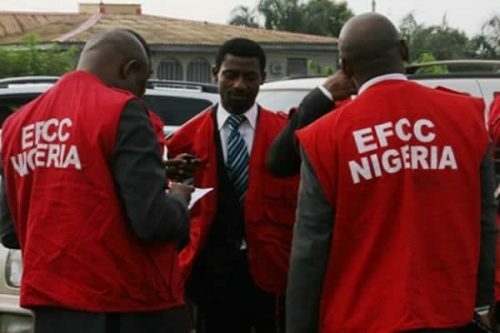 The Economic and Financial Crimes Commission, EFCC, Lagos Zonal Office, Friday, arraigned two suspected fraudsters, Feranmi Isaiah Akinluyi and Sogo Akinola, a.k.a Obaje, before the Special Offences Court, sitting in Ikeja, Capital of the State. The suspects were arraigned on a five-count charge, bordering on obtaining money by false pretence and stealing over N24. 9 million. The anti-graft commission’s spokesman, Tony Orilade in a statement said the first defendant, Akinluyi, a lawyer, and the second defendant, Akinola, also a lawyer and an employee of 9Mobile (formerly Etisalat Nigeria), allegedly swindled a number of unsuspecting victims by claiming to be into property business. But the defendants were said to have pleaded not guilty to all the charges. It was on this basis that prosecution counsel, Ahmed Yerima, asked for a trial date and urged the court to remand them in prison custody. But the defendants counsel, Olugbenga Akinlabi, instantly informed the court that the charge was served on the defendants, “just this morning in the court premises”. He added that the defendants were also standing trial before Justice Oluwatoyin Taiwo of the Special Offences Court, sitting in Ikeja for a similar offence for which they are presently on bail. The defence counsel, therefore, prayed for a short adjournment to enable him file and serve the prosecution with the bail applications on behalf of his clients. In his ruling, presiding Justice Mojisola Dada granted the defendants bail and adjourned the case to May 6, for hearing of the bail applications and commencement of trial. Why is Investing So Confusing For Most People?